Used for Building project,Doors and windows,Greenhouse plantings. Corrosion resistance, No leakage, High toughness. 2m/4m/5.8m/11.8m, Or as client's required. 1. Normal packing( Standard exporting package, Plastic film or bulk). 2. As per customer's request. 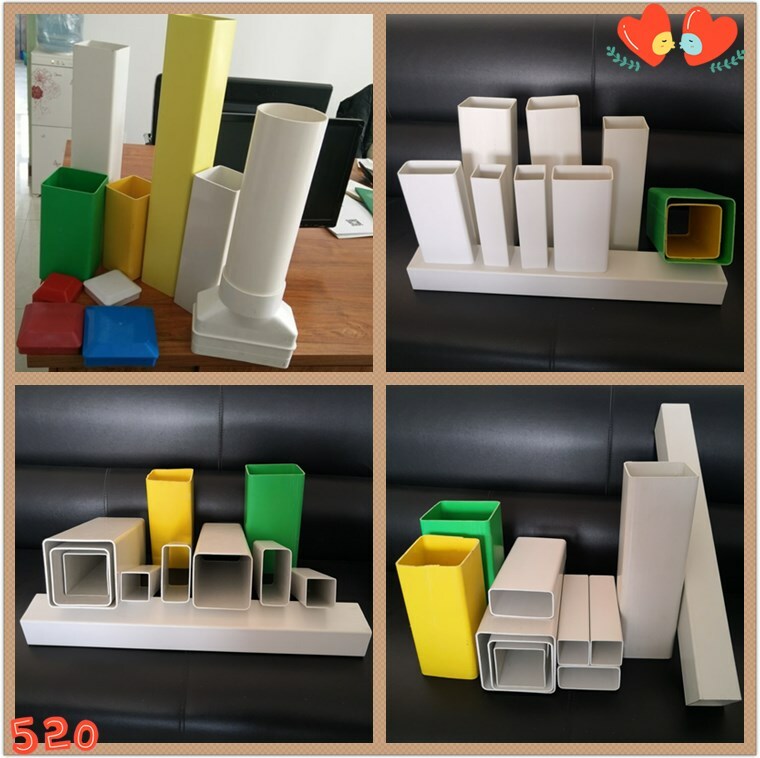 PVC square pipe is polyvinyl chloride (PVC) as the main raw material, match with flexibilizer, anti-aging agent and other auxiliaries, Sheath and Sub-pipe as a whole, One times extrusion molding. 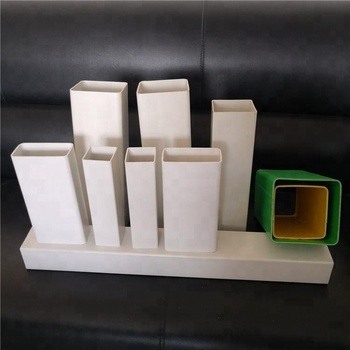 Product name: PVC square/rectangular pipe. 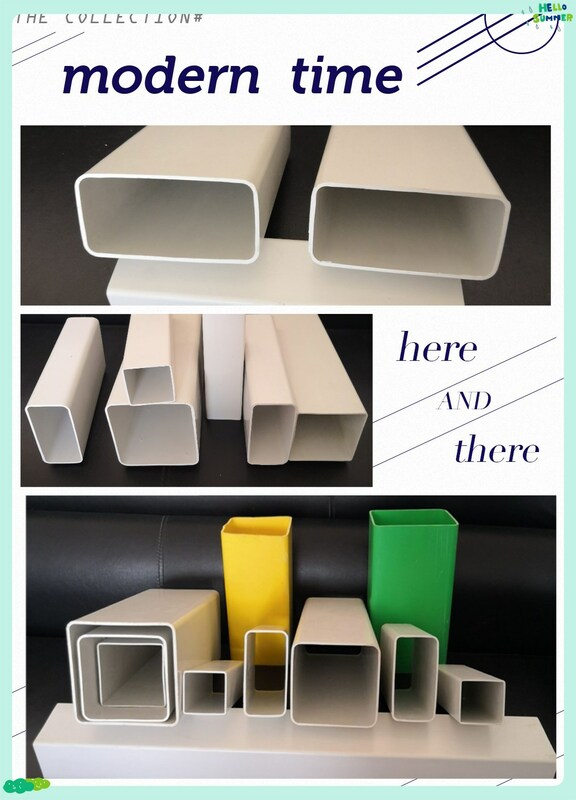 Appearance&Color: Clean smooth white pipe, ( Also can produce Gray, Yellow, Blue , Green and others color). Life span: 15 Years Under Normal Conditions. Longitudinal retraction rate: ≤5.0 %. 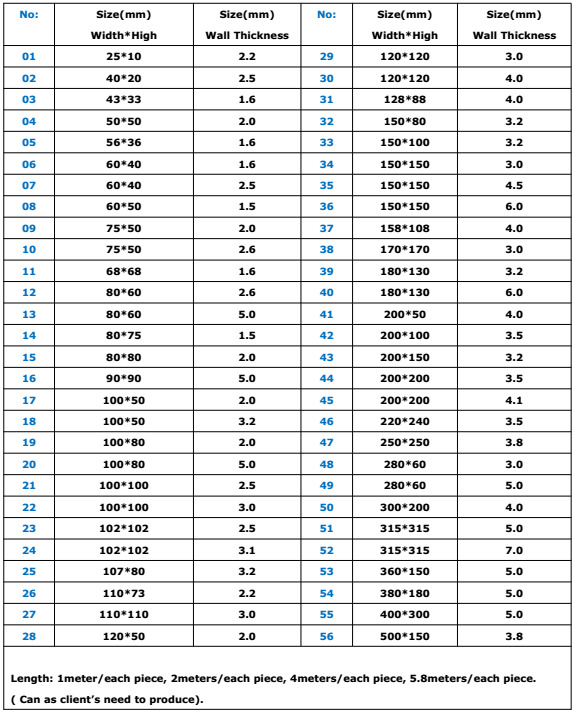 Tensile yield strength : ≥30Mpa. Vicat softening temperature: ≥75 ℃. Drop weight impact test(0℃): 9/10 Don't burst. Outside the load resistance: ≥9.5 (KN/200mm). 1, Corrosion resistance, No leakage, High toughness. 3, Low friction coefficient, High value of utilization. ( PVC SQUARE / RECTANGULAR PIPE). 1, Used for water system, Building And engineering drainage. 2, Power engineering cable protection. 4, Doors and windows application, Interior trim. 5, Greenhouse hydroponics for vegetable and fruits cultivation. 6, And others application field. With our own mould workshop, customzied service is avaiable. We can offer OEM service according to customers' Logo, package, etc. Customers just need to afford the shipping freight to get free samples. 24 hours online service available. T/T, L/C, Western Union, Paypal, etc. Acceptable. Good service and superior speed. Q1. What material of pipe are you specialized in? 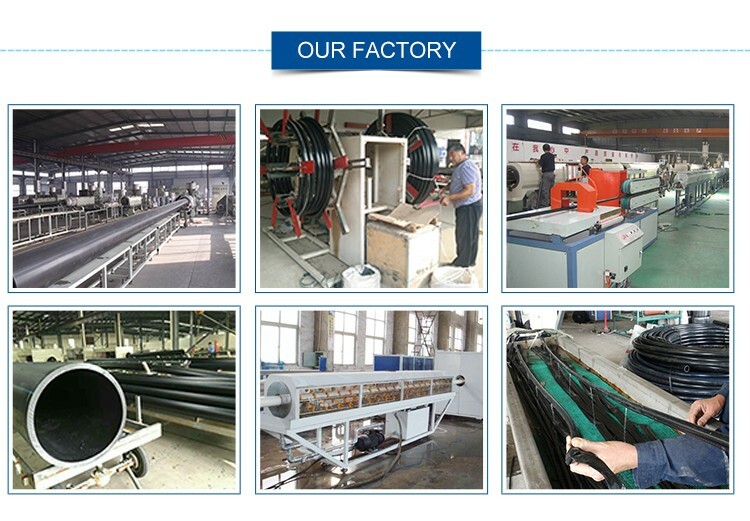 A: We manufacture PE, HDPE, PPR, PB, PE-RT, PEX Aluminum composite pipes and fittings. Q2. Please tell me your largest outer diameter for pipes. 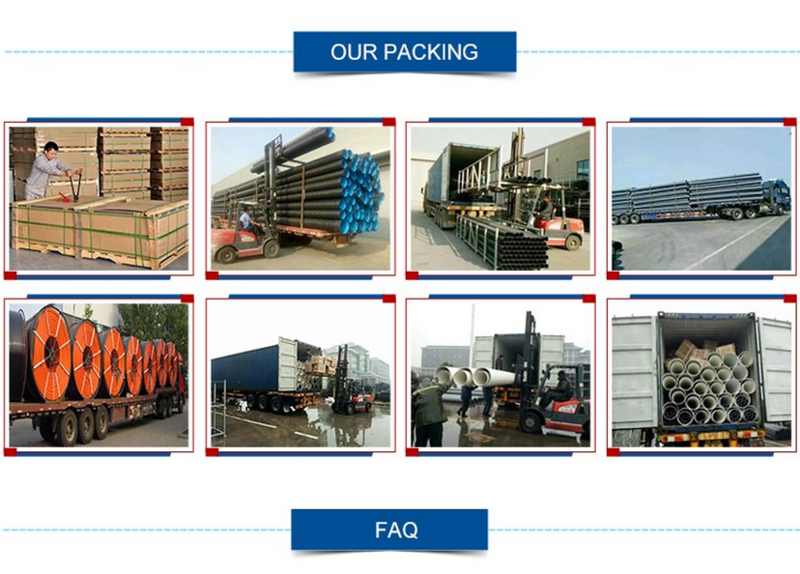 A: We can produce 1600mm diameter (PE pipe) as the largest size. Q3. The price of your products is higher than others. A: We can't promise you the best price, but we can promise you the best quality. We import raw material from famous companies such as Borstar, LG Chemical, Chervrom, Hyosung, Lydellbasell, Sinopec. Q4. 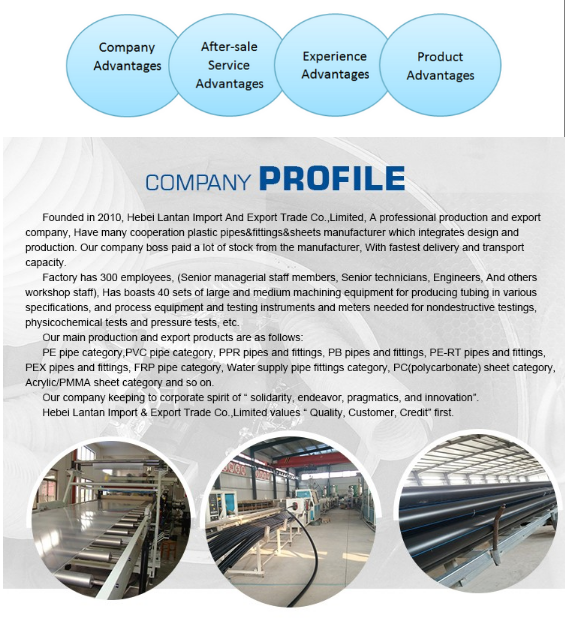 For pipe fittings, what do you do mainly? A: For fittings, coupling (socket), elbows, tee, reducer, union, valve, cap and copper insert fittings are our main products. Q5. Where is your factory located in? 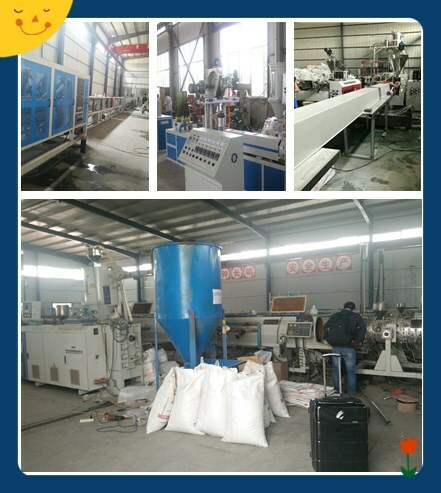 A: Our factory located in Tianjin City, the second largest port in China, which is only one hour away from Beijing airport. Q6: Can you provide us some samples for testing? A: Of course, my friend. For small amount of samples, we can provide you for free. Q7: How is our customer service? A: all our sales representatives can speak fluent English. They will answer all of your questions in 24 hours. 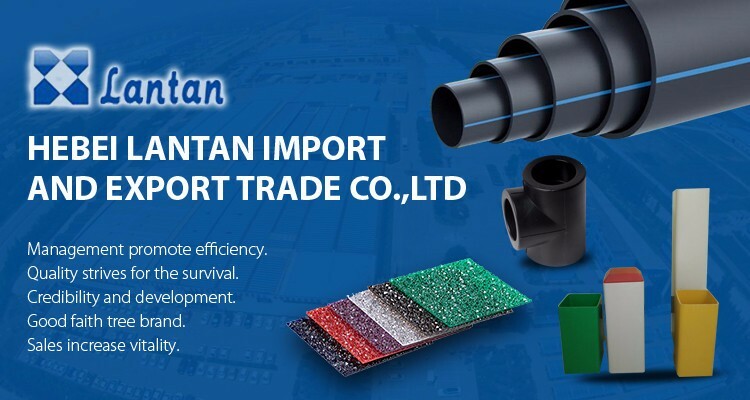 Hebei Lantan Import And Export Trade Co., Ltd.